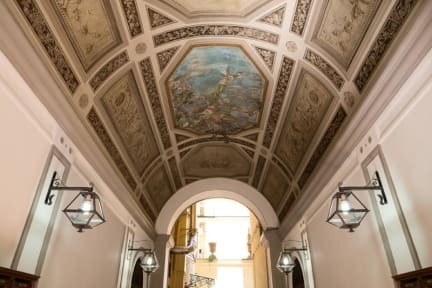 Residenza Cernaia i Rom, Italien: Reservér nu! Cancellations can be made free of charge up until 5 days before the arrival. NO SHOW or Standard Late Cancellation : the full amount of the reservation will be charged. -We reserve the right to request advance payment. For groups more than three rooms, the hotel will apply different policies. Welcome to Residenza Cernaia It is located in an elegant area, close to Piazza Barberini, Piazza della Repubblica and the famous Via Vittorio Veneto.Inside an historic building recently renovated.We will welcome you with vaulted ceilings decorated with frescoes of the 800 perfectly recovered and a new elevator,24 h assistance on call and free baggage deposit.Italian breakfast (served in a typical Roman outdoor cafe). It is 500 meters / 10 minutes walk from Termini Central Station where it is possible to take buses, national and international trains, taxis and airport shuttle. Repubblica and Castro Pretorio Metro Stations A and B are 5 minute walking from the property. Residenza Cernaia offers rooms with air conditioning, private bathroom,daily cleaning service, free WiFi. Check out from 00:00 to 12:00 .